Product #20613 | SKU 3I-0907-6SLR | 0.0 (no ratings yet) Thanks for your rating! Store and protect a DSLR with attached lens, extra lens and accessories with the waterproof and dust proof, black iSeries 3i-0907-6SLR Waterproof DSLR Camera Case from SKB. This strong case is made of ultra high impact polymers and has MIL-STD-810F, MIL-STD-C-4150J and MIL-STD-648C & IP67 certifications. 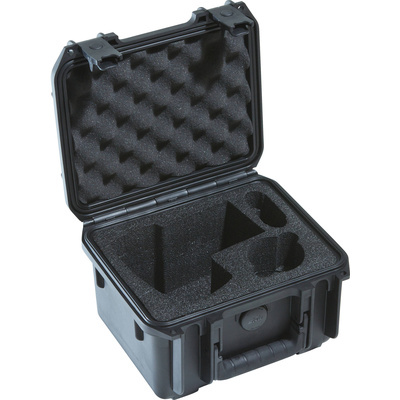 A fully-featured case it has a built-in, automatic ambient pressure valve and a foam interior. The case closes with two latches and there are openings for user-supplied padlocks. For strength and durability the case has a moulded-in hinge. Carry the case in hand, or with the large, rubber over-moulded cushioned top grip handle.